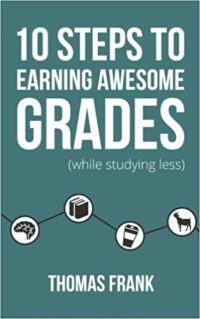 SYNTHESIS: A short, practical guide for students on being more productive and studying more effectively by veteran student-success writer, Thomas Frank of College Info Geek. Eat healthy 90% of the time. Get at least 6 hours of sleep per night. Speak up in class discussions. Form a note-sharing study group. Use a habit tracking tool (like Habitica). Find next year’s accommodation 7 – 8 months ahead of time. Plan for the following day the previous evening (charge devices, pack bags, sync files). Use notes (physical and digital) and alarms to trigger your mindfulness. First, push yourself for 15 minutes to solve something. During that time, note everything you do to try and solve the problem. Only then, if you’re still stuck, should you ask for help. Copying down word for word will distract you from taking time to understand the content. The Outline Method – a standard hierarchical approach. Cons: can lead to mindless note-taking (see above). Cue column – Questions based on the main ideas and important details. Note-taking column – Contains your normal notes during class. Summary column – End of class summary of your notes column. Pros: sets up notes for efficient studying while you take them. Write a single “umbrella term” in the middle of a blank page. Write words around it that expand the idea and more words around those. Use lines, colours, doodles and diagrams to connect all the words. The Flow Method – a holistic approach that forces active note taking and best used for topics where ideas readily connect. Write important terms down as they come up. Connect them with arrows to show links. Synthesise things in your own words (don’t parrot). The “Write on Slides” Method – annotate your slides instead of writing separate notes (be sure to stay active and don’t get lazy!). Don’t do all your assigned reading. You won’t be tested on a lot of it. Secondary readings – things it would be nice to read (smaller books, articles, case studies etc…). Essays – Identify and summarise the main ideas. Pseudo-skim – Speed through filler text, slow down for the important stuff. Read the chapter backwards – Prime your brain with any summary points, glossaries and questions. Create questions – As you read, rework the details into questions you can use to test yourself later. Mark up and take notes in your book – Use sticky flags if you can’t deface the book, otherwise use a pencil or highlighter. Write summaries of what you read as if you were teaching it to others. Summarise what you’ve just read from memory immediately after finishing (active recall). Make it simple and test your knowledge by imagining teaching it to someone else. This will let you focus on doing without thinking making you more efficient. Create and update a long-term plan for your education from day 1. Make a list of academic and non-academic things you must do this week. Group those activities by “High” and “Low” thought-intensity work. Plan and adapt your tasks during the week to your energy levels. Get to know when your typical high energy level times are and adjust accordingly. Look at your calendar and to do lists. Make a list of things that need to be done tomorrow. Positive impact – What will get you closest to your goals? Negative impact – What will stop your life spiralling into chaos? Willpower – What will require the most willpower to complete? Combine this with your start time to come up with an end goal for the day. Start from the top of the list and work your way down. Estimate your task times for the day (e.g., task A: 1 hour). Record your actuals (e.g., task A: 1h 37 mins). Divide your actuals by your estimates (97 mins / 60 mins = x1.62). Use your fudge ration to improve your estimates. Trust your gut once you have a better feel for setting timings. Splitting the project into tasks. Grouping the tasks into contexts. Planning exactly how and when you’ll devote resources to them. Design your environment deliberately to minimise friction. Minimise real-world and technical distractions. Work where others are working (e.g., libraries, coffee shops and cowering spaces). Think out of the box (e.g., attend concentrated seminars or work weekends on a topic). Try different genres with different kinds of work. Experiment with white, pink or brown noise. Trial ambient noise (e.g., rain, coffee shop etc…). Avoid distracting places – See above, comes down to personal preference. Avoid distracting people – Studying with friends isn’t always a good idea. Learn to say no to fun things. Make it difficult for people to contact you (see above and below). Turn off most of the notifications. Put in on do not disturb mode. Block your access to time-sink websites with e.g., StayFocusd (Chrome), FocalFilter (Win), ColdTurkey (Win) or SelfControl (Mac). Uninstall time-sink apps (e.g., games). Hide the bookmarks bar in your browser. Set up a “work” user account on your computer. Use a different computer entirely (e.g., in a computer lab) to do your work. Download and install Dropbox/Google Drive – gives you access to your files wherever you are. Set up your folder structure – split your life into sensible pieces as a start. Set up your college folder – split it e.g., by year > class > projects, add extra folders for e.g., clubs. Build a quick capture system to get ideas out of your head with tools like a physical notebook or apps like Drafts (iOS), Evernote, Scanbot, Trello, Google Calendar, Todoist or Pinboard. Use Evernote (or Dropbox) as a second brain. Some good options include: Wunderlist, Remember the Milk, Google Tasks, Todoist, Producteev, Omnifocus and Asana. Fight entropy and friction by using a checklist to keep your world and your systems tidy each week. Delay – the time it’ll take you to get the reward. Understand what part of the equation is suffering. Accept delay – give yourself micro-rewards (e.g., chocolate). Habits allow you to act without using willpower. Building good habits makes putting in consistent daily effort easy. Habitica makes building good habits easy by making it fun and social. Give yourself permission to batch your fun (e.g., games, social media) into high-density stretches that incentivise you to get your work done. Do as much as you can in that time. Have a short 3 – 5-minute break. Gather your materials – syllabus, handouts, notes, assignments, textbook. Identify the topics likely to come up in tests – prioritise these in your learning. Create study guides for each topic – design questions that will test your active recall on the topic. Get studying – write model answers to the questions. Test yourself – practice until it’s easy to answer those questions under test conditions. Prioritise active learning over passive learning. Passive learning – exposing yourself to material and hoping it will sink in. Active learning – force yourself to recall information independently with testing. Use spaced repetition (see Anki) to maximise learning efficiency. Forces active recall just when you might forget it. Helps you focus on things you still need help learning. Learn to notice your confusion – be specific about it (see step 1), test for gaps with problem sets. Understand, don’t memorise – chip patiently away at concepts until the “Aha! I get it!” moments, test by explaining it to someone else. Do. The. Math! – Learn by doing lots and lots of problems. Do an unstructured brain dump – Knowledge, questions, points, sources, quotes. Develop a focus and questions to answer – This will break down and give your research direction. Find sources – Use Wikipedia, textbooks and Google Scholar to find sources. Make a personal copy – Save or scan a copy to e.g., Evernote or Dropbox. Annotate the material – Skim while creating short notes that reference page numbers. Decide if you’re done – Stop when you have at least 2 facts to support each main point. Write an awful first draft – Just get ideas on the paper, stay detached by doing so in a separate document or app like Evernote or Byword (Mac, iOS). Is there good narrative flow? Is the main idea clear, relevant and effectively communicated? Do the sections back the main idea up? Is there enough research to support the facts? What can I remove or state in a simpler or better way? Print out the paper and mark the errors in full by hand. Read the paper out loud to yourself. Take note of your common errors (i.e., spelling, punctuation). Ask for feedback from experts and non-experts. Use each potential reviewer only once. Explain what kind of feedback (detailed, big-picture) you want. Do a final check – Ask yourself “Is it ready?” Once you’re satisfied, let it go. Make small-talk and be a generally nice human being. Gather names, numbers, emails – send these to the whole group during the meeting. Have everyone share a bit about themselves (strengths, weaknesses, likes, dislikes). Create and schedule milestones for the project. Assign every task to someone specific based on strengths and preferences (never assume something will get done). Set a time for the next meeting. Nominate an editor whose job it is to collect and integrate all the finished components. Trello – To track and delegate tasks. Slack – For team communication. Google Docs – For real-time document collaboration. Pick 1 – 2 main focusses. Write down a goal for that area. Write an action plan to achieve it.